The Torrent 5100 GGSN Test System actually consists of a suite of products which work together in a unified manner to provide a realistic, high performance, linearly-scalable GGSN. The main feature of the system is that it simulates mobiles and the application data traffic that they generate as precisely as possible. A single MTS-5100 Mobile Traffic Simulator is capable of generating activation rates of over 40,000 contexts/sec and over 550Mbps of full-duplex data. Because the system scales linearly, traffic intensity may be increased simply by adding more hardware. Test cases may be written to automatically configure and monitor the system under test (via ssh, telnet, ftp, etc), in addition to performing UMTS/GPRS tests. Any traffic profile can be scaled linearly by simply adding more computing hardware. A novel feature of the architecture is that this can be done without any test case changes. 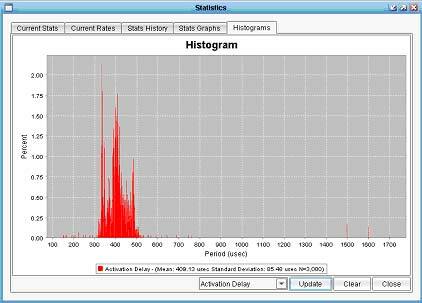 A unique feature of the system is that in addition to allowing you to see the mean and standard deviation of various statistics, it also allows you to see the entire histogram for that statistic with extremely high resolution. Below, for example, we can see that the average activation delay is about 400 usec and that the standard deviation is low. This is particularly useful when looking at HTTP for example because you can observe whether or not certain mobile subscribers were starved for bandwidth. This feature allows you to study the quality of service received by various subscriber groups and see how well the system is prioritizing interactive traffic over background traffic, etc. The Torrent 5100 permits a significant number of error scenarios to be tested with it's error injection feature. This facility allows packets to be randomly dropped, delayed, or corrupted in a controlled manner (e.g. 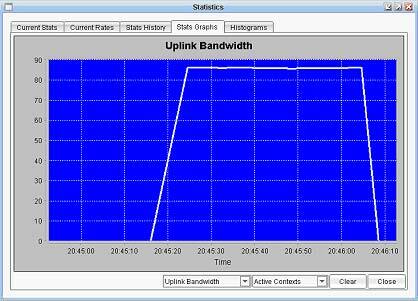 only corrupt uplink control packets with probability 0.1, and delay downlink data packets with probabilty 0.05 for a mean of 500ms). MMS - Insert a virus file or insert hex data into an MMS message. SMTP - Insert hex data into the message, or convert a virus file into MIME format and send it. 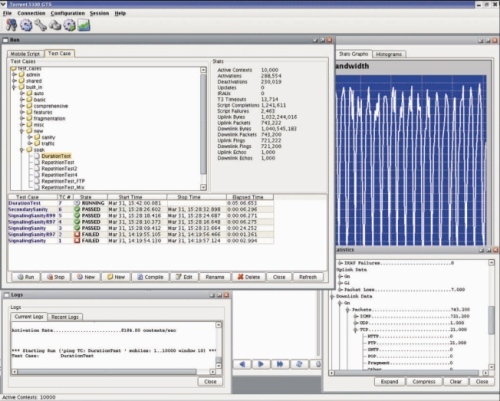 PTT - Alter RTP audio by insert virus hex strings or files of hex data. HTTP Post - Insert virus files or strings. Large viruses (up to 64KB) can be injected. Each traffic generation card simulate hundreds of SGSNs; with multiple cards, thousands of SGSNs can be simulated. In addition to static routing, both RIP and OSPF are supported so that correct routing of mobile packets on Gi may be verified, for example. The system can support any network interface supported by Linux; it has been specifically tested with Fast Ethernet, Gigabit Ethernet, and ATM AAL5. Aside from being very easy to install and configure, the Torrent 5100 GTS features an automatic software update facility which simplifies both administration and support. The Torrent 5100 GTS features a modern GUI and supports multiple simultaneous users; GUI clients may be either Windows or Linux based. Support for MMS messaging over WAP 2.0 is built in to the simulator and it includes an MMSC implementation on the NTS-5100. 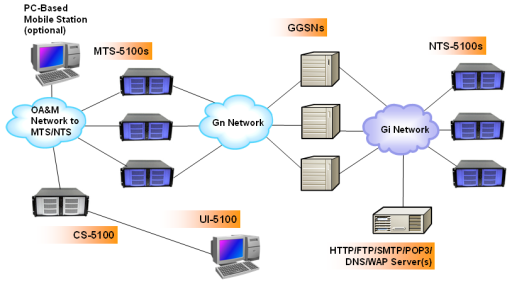 Mobiles may optionally resolve names to IP using DNS (over GTP), which is another realistic and unique feature of the Torrent 5100 GTS. As mentioned earlier, the MTS-5100 is capable of simulating up to one million sessions from a single PC. It can generate 40,000 activations per second and 550 Mbps of data. The MTS-5100 can interact with real application servers on all traffic types except for MMS and PTT. In these cases, it only interacts with the NTS-5100. The MTS-5100 not only simulates generic per-spec mobiles, but can also emulate the behaviors and traffic patterns of leading mobile brands. The first instance of this is present in the 2.0 release. The MTS-5100 can be configured to provide Blackberry Always-On behavior. This behavior to keep sessions alive is problematic for GGSNs and a worthy addition to your test coverage. Because the MTS-5100 drives so much of the system, its capabilities are very intertwined with the discussion in Key Features and Traffic Types. It's also possible to run multiple PC-based Mobile Stations through the MTS-5100. HTTP GET: Any NTS HTTP URL will be accepted. The NTS-5100 will return a block of data that is configured to be either fixed or randomly sized. RADIUS: Support for RADIUS is built into the NTS-5100 allowing GGSNs to use it for both user authentication and accounting. 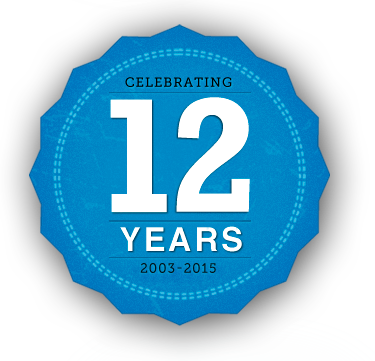 Includes support dynamic user address assignement. In addition, the NTS-5100 offers a built-in UDP echo server, to echo packets sent by the MTS-5100. Finally, the NTS-5100 rounds out your view of the network with its own set of hierarchical data traffic statistics from the network perspective. The CS-5100 server automatically configures, starts, and directs the MTS-5100 Mobile Traffic Simulators and NTS-5100 Network Traffic Simulators to run tests as instructed by the user through the UI-5100 GUI (either manually or via a test case). One advantage of the CS-5100 / UI-5100 is that key information about a test run is presented all in one place: results, statistics, histories and more. For example, a user can examine more than 450 Gn and Gi statistics, including packet loss and latency, organized hierarchically to see the big picture or the fine details. Statistics can be observed in user windows or exported to Excel. A traditional use for the Torrent 5100 GTS is to stress a GGSN-under-test. But some customers need an entire cellular network to be simulated in order to exercise their products. In this case, the GS-5100 comes in handy. The GS-5100 accurately simulates the GGSN function from the perspective of control and bearer plane action. It's what we use to test our own network! Drop it in, and you have a full 3GPP simulation.